I write a blog I call the "Lively Tradition,” which is a slight play on calling ourselves a “Living Tradition.” What good is our tradition if it is merely alive, but not lively? What I blog about mostly is Unitarian Universalist Public Theology: that space where our theology intersects with what is going on in the real world. My starting point is that theology and religion, are public subjects, made by people in society, and are responses to what is going on in the world at the time. So, I am interested in questions like "How did the founding of the UUA in 1961 fit into that time of the Southern Civil Rights Movement and the election of John Kennedy? Why did we choose to write down our seven principles in the middle of the Reagan Administration? And conversely, what do our UU theologies say to us about the world we face today? And this world we live in, of grotesque economic inequality and cataclysmic climate change, how does our theological tradition respond. So, I ask when approaching Channing's Baltimore sermon 'how is this a theological statement of its time?' Why was it given in in 1819? I am less interested in Channing’s thoughts on how to read the Bible, or the main points of Christian doctrine than I am in what was the thinking of that time. In 1819, engaged people were still influenced intellectually by the American revolution. The Revolutionary War ended in 1781, 38 years earlier. The Constitution was written 32 years earlier. The Revolution was closer to Channing than the radicalisms of the 1960's and 70's are to us. The American Revolution saw the emergence of a new political ideology: Republicanism. And at that time, Republicanism was against the system of aristocracy. European society was traditionally governed by a titled nobility, the aristocrats. They had titles: Lord This, and the Duke of That etc. You've all seen Downton Abbey. The American colonial revolutionaries rejected that whole system. They believed that all men were created equal. Not in any sense that we now conceive of equality, of course. But they rejected the though that there were certain noble families, a sort of subspecies of human, that were entitled by birth to wealth and power. Indeed, one of the most far-reaching and significant provisions of the Constitution of 1789 was that it expressly forbid the granting of titles of nobility by both state and federal governments. That was a decision. Further, US Citizens could not accept any foreign titles of nobility. That was a decision to prevent the English or French Monarch from exporting their system here. This was Republican political theory. No, they did not believe in equality, but they resisted and ended aristocracy. It doesn’t seem radical now, but it was then. I believe that Republican theory helped cause the intellectual collapse of Puritan Calvinism in New England. I think that this is hard to trace, because theologians do not readily admit that their theological speculation is being driven by social events and political ideology. Yet we know they are. But consider this: the theological justification for an aristocracy is the same as the theological justification for the pre-destined elect, which central to Calvinism. Why were some people destined for Heaven while the rest of us head for Hell? Why? The Calvinists answer was “Because God made it that way, and His ways are beyond our judgement and question. God ordained it for God's own purpose, and the test of our faith was to accept the present state of affairs as being God's intention”. Why is there an aristocracy? God only knows, which was exactly the point. Only God knows and that should be good enough for us. Same logic. Slowly, and we all know this story, some of the Standing Order clergy of New England fell away from Calvinism and its theory of the pre-ordained elect, and the utter depravity of humanity. It started a whole process of deconstructing the Calvinist consensus. If we have read our Conrad Wright, we know the story of how each domino fell: If we were not all condemned, then we didn't need to be saved, and so then why would we need a Savior, and if Jesus was not a Savior, then why did he need be divine? But the core issue was this: What makes more sense? What is more moral? That God draws these distinctions in this life and in the next? Or that each one of us has within us the power to cultivate our selves, to educate ourselves, to teach ourselves everything to become noble and refined and sublime ourselves. I suspect the religious liberals of the late 18th century Boston were applying the political theory of the American Revolution: its revolutionary republicanism to theology. In 1805, the orthodox Calvinists struck back against the emerging liberal theology (which was the theological application of Republican political ideal of equality.) They opened up an aggressive campaign against the liberals. They would not exchange pulpits; they would not enter into common organizations; they applied theological tests to the selections of professors at Harvard. It was a typical conservative attack against liberals. Liberals are too permissive. Liberals are undermining long standing traditions. Liberals are questioning the eternal truths. Liberals are no longer Christian. Typical conservative attacks met by typical Liberal responses. Face it, we are just shocked that anyone could be so mean to us. We are not doing anything wrong, just thinking thoughts and saying a few obvious truths out loud. It was all unfair, and not really true. Why can’t we all just get along? But here in 1819, here in Baltimore, William Ellery Channing flipped that script on the conservatives. He said to the conservatives: You call us Unitarians, like that is a bad thing. He said to the conservatives: You say that we read the Bible relying on reason, like that is some sort of bad thing. There is no other way to read it, and you do it as well. You say that we think God is too loving, as though that’s a bad thing. He also stood up to the charge the liberals had a watered down and deficient form of Christianity. He flipped that script by arguing that Unitarian Christianity was more true, more biblically based, and more in the spirit of original Christianity than our Calvinist opponents Channing argued that liberal Unitarian Christianity was, in fact, pure and simple Christianity. Do single sermons change the course of history? Much as I, and all my preaching colleagues, would like to think so, probably not. But it is true that when Channing flipped the script, what followed was known as the golden age of Unitarianism. For the next few decades Unitarianism in New England moved with confidence: growing, planting new churches, creating new institutions, spawning new religious and philosophical movements, nurturing thinkers and writers and authors. Channing himself became one of the leading spiritual voices of his day, and the Unitarian religion had a profound impact on the social order. Flipping the script: Going from Defense to Offense. Going being apologetic to being self-confident. I believe the time has come for Unitarian Universalism to flip the script in contemporary American religious culture. Let's put this moment into historical perspective. The Unitarian Universalist Association was formed in 1961. At that time, it seemed that Unitarian Universalism was a religion made for its time. It was a new expression of older traditions; it seemed in tune with an optimistic liberalism that was personified by John F. Kennedy, who pointed out that the "Torch Had Passed to a New Generation." And for those first years of our existence, Unitarian Universalism was creatively challenged by and stretched by the African American movement in the South. It was a heady time for us. The early 60’s were a time of growth and vitality for the new Unitarian Universalism. We were in tune with an ascendent liberalism and filled with hope and confidence. But then, after less than a decade, the tide turned in this country. Conservative politicians, theoreticians, and theologians had found a way to knit together all the strands of discontent and resentment with the changes going on into a conservative majority. And just as in the post revolutionary world in which William Ellery Channing worked, conservatives began a campaign to demonize all forms of liberalism in American culture. Somebody said, we intend to make liberalism a dirty word, and for much of the culture, they were successful. Their critique of liberalism was simple: Liberalism was too permissive. It had naive view of human nature and, as a result, failed to fully understand just how evil, and how committed to evil or demonic, some people were. We did not grasp the danger that the demonic posed to all of us. Where we saw the condition of poverty, they saw the sin of laziness. Where we saw the circumstance of an unwanted pregnancy, they saw the just punishment for lust. Where we saw the cruel stigmatization of gays and lesbians, they saw perverts demanding sexual license. Where we saw poor people crossing borders to work, they saw greed and theft. Conservatives, whether political, economic, social or religious, believe that our problems come from bad intentions, bad behavior and sin. Liberals, in their eyes, aid and abet the sinful. Our permissiveness just makes everything worse. So their work is to forcefully point out the evil that people do, in the hope that we will stop trying to help them. The result is that the conservative cultural project is to demonize people. Let me say that again, because I mean this quite literally. The signature gesture of modern conservatism is demonize: to assign to someone purely evil intentions. And to blame them for what has gone wrong. And liberals have been demonized as well. We were latte-sipping, chardonney drinking, cheese-eating, volvo-driving, politically correct, humorless, faddish, overly-privileged, romantic, radical chic, tree-hugging, dirt-worshipping, birkenstock-footed, unattractive, bra-burning, hairy-legged lesbian and limp-wristed faggy, tax and spending, draft-dodging, dope-smoking, LIBERALS. And UU churches were full of them. Can I say that to some extent or another, every Unitarian Universalist I know has absorbed this toxic message and internalized it. We have allowed a self-hatred to grow up in our hearts. Please notice how much contempt we shower upon our UU churches and on other UU's. Notice how easily we accuse each other of bad intentions, and the grossest hypocrisy. How easily we say that we don't walk the walk, even though we talk the talk. How we condemn checkbook activism, even while we are writing the check. I want you to understand that the reason we talk like this, and act like that, is not because we are morally deficient people. It is because for our entire lives, we have been part of a cultural population which has been ridiculed, vilified, demonized, but mostly ridiculed, mocked, minimized, and made a joke of. For my entire adult life, Unitarian Universalists have been obsessed with the question: “What’s wrong with us? There must be something wrong with us that we are not as successful as our rivals. What’s wrong with us? It is time to flip that script. It is time to go from being hunkered down and defensive to being clear and forthright. It is time to state our purposes and goals, and to make some clear distinctions that separate us from our opponents. 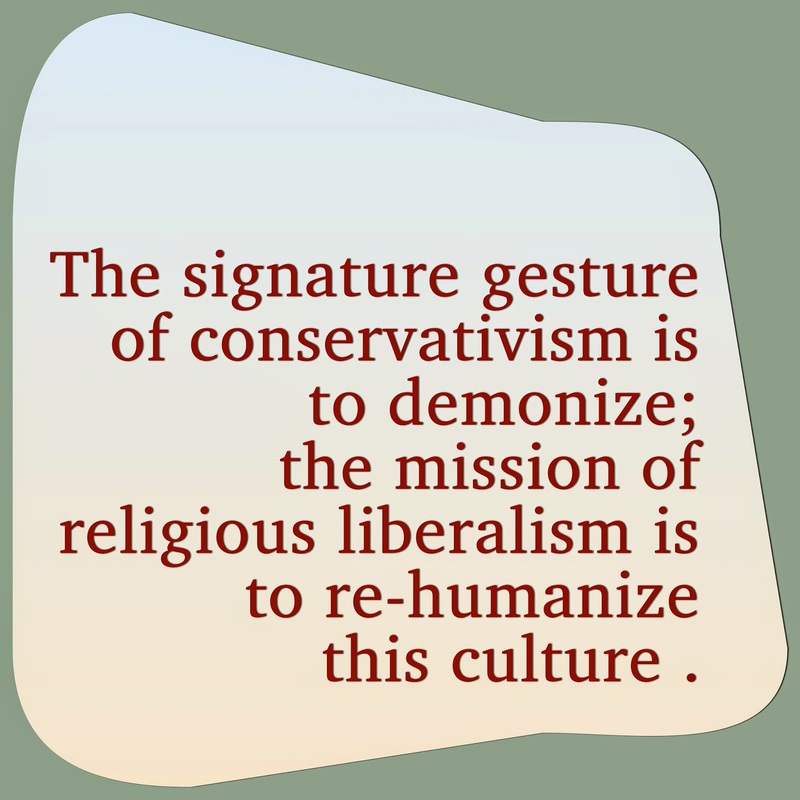 If the mark of a conservative theology and politics is demonization, the purpose of liberal theology and politics is humanization. Unitarian Universalism’s mission is to re-humanize this culture, to break the grip of demonization and blame. We are not looking anymore for a safe corner where we can be left alone, a sheltered haven from a conservative culture. We can no longer be content with forming loving communities of like-minded people. It is not enough for us to be a little nicer to visitors, and to be more welcoming to people who come to us. No, our purpose is humanize this culture: to bring back to the center of our thinking.human beings, those images of God, each one worthy, and each one caught up in web of mutuality, embedded in a world that is full of oppression and privilege. We will humanize this culture we live by calling each other, one at a time, and as a whole people, to the virtues of liberality: honesty, humility, generosity and gratitude, reverence and awe, openness, solidarity, self-possession. Liberalism, the virtues of liberality, are not the problem. They are the solution. Those virtues make for happy and healthy people, and societies. They are the antibodies that resist and reject the language of demonization. William Ellery Channing came to Baltimore to ordain Jared Sparks. Today, I ordain you all into a great struggle to detoxify our society, to meet the poisons of demonization with the balm of humanization, to meet dismissal and contempt with solidarity, to meet indifference with generosity, to counter prejudice with openness, to answer judgement with truth and humility, and the contain the contagion of blame and fear with bravery, with reverence for each other and with self-possession. I ordain you into a gospel of love, to not only believe in love, but to work for the institutionalization of love as the foundation of all human civilization, to stand by its side. Preach Love more loudly with your lives than with your lips. as the One God, the Benevolent Father. but by its heat which warms my heart. I know it only by the hope it brings me. CMW: thanks! I don't need credit for the quote. Spread it around. I hate that I can't Tweet or share this right from here. Make that happen, mister! Perfect! I want to cheer. Instead I will share widely--and start to be part of the solution instead of part of the problem. To move from apologetics to proclamations -- the call and the need are there; will we respond? And the world may appreciate it more than our fellow Unitarian Universalists if we do this because it will require and mean change which might be too much for those caught in old definitions. You image of flipping the script is so apt ... but it will mean all of us will need to do some cold reading of some very new (and a few forgotten) scripts. As I was putting off working towards beginning to write my 'annual report' sermon for this week with a title I'd chosen weeks ago of "What's Right with Us? ", I saw a link to your Baltimore sermon. Apparently the Spirit was moving in my moments of procrastination, as it was when you stepped into that pulpit, my friend. Bless you and the horse you rode in on! Thank you for all you said and, especially, for the concluding benediction. I think I'll print and tape it to the bathroom mirror so I read it regularly. Well done and well said, a fine starting point. Thanks! I'm not a conservative in any way (either religiously, socially or politically), but your core statement is off-puttingly judgmental. I am a progressive liberal Christian who has known more than a few religious conservatives and served alongside them on mission trips and service projects etc. They were, in many cases, some of the most amazing examples of God's love and compassion for humankind and the world. Yes, I've known a few religious conservatives whose sole mission in life seemed to be to judge others and bend them to their way of thinking, but I've known a few religious liberals (some of whom are regular attendees at UU churches) who are like that as well. Anyway, overall I share and support the theology of humanization. But I would be careful about your rallying cry transforming religious liberalism into a theology of demonizing religious conservatives.